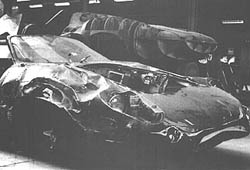 Ted Loades spotted the crashed XJ13 stored at Jaguar and offered that Abbey Panels would rebuild it for £1,000! ‚Lofty’ England accepted. Note original body formers in background – luckily they had been stored too. 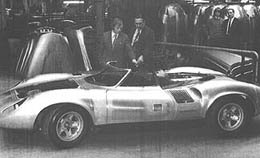 The freshly rebuilt XJ13: figure on left is a young Tony Loades. Note London taxi and ‚E’ type bonnets in the background. The car finally made its public debut in July 1973 when ‚Lofty’ drove it around the Silverstone during the British GP meeting. This logical, no-nonsense stance was one which Lyons, above all others, appreciated. Firstly, he knew from bitter experience how things could go wrong on the body side – in 1937 the company had nearly gone down through poor quality from suppliers – and started on the road to becoming self-sufficient when he purchased Motor Panels. But this had to be sold when, after the war, Jaguar was short of cash. Lyons also had little regard for conventional working hours and despaired at the short-sightedness of those unions and workers who insisted on adhering to out-dated working practices. This is why, during the late 1940s, Abbey Panels became, in effect, Jaguar’s in-house styling prototype department. Many will be familiar with photographs of the styling mock-ups through which Lyons evolved his final styling master. These were not fashioned by Jaguar people, but by Abbey Panels men!